Rocking Star Yash has reportedly won Rs 25 lakh on Ramesh Aravind's Kannadada Kotyadhipati, which is aired on Star Suvarna. 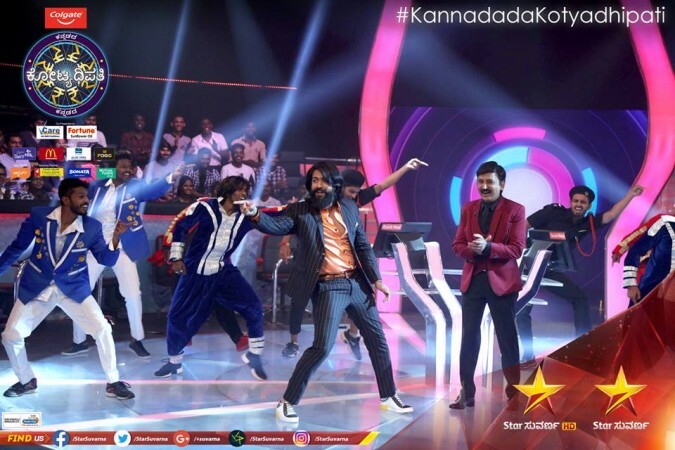 After Golden Star Ganesh, Rocking Star Yash has taken part in Ramesh Aravind-hosted Kannadada Kotyadhipati. The special celebrity episode will be aired on Friday, July 13. The actor's episode was shot recently and Star Suvarna. The channel has created a lot of buzz around the show by releasing its promos on social media sites. Going by the reports, Yash has won Rs 25 lakh. "Yash has donated the money for the charity. The entire amount will be used for the welfare of the people through his NGO Yashomarga Foundation," a source tells. It may be recalled that Ganesh had won Rs 12.5 lakh after quitting the question from which he would have won Rs 25 lakh. Kannadada Kotyadhipati is the Kannada version of Amitabh Bachchan-hosted Kaun Banega Crorepati. The first two editions were hosted by Power Star Puneeth Rajkumar. Siddharth Basu of Big Synergy, who is known as the Father of quiz on Indian TV, is producing the show. "Kannadada Kotyadhipati remains the most-loved show as anyone can win here irrespective of background, education, caste, provided (s)he is empowered by knowledge. The stringent processes are practiced to ensure fairness, which enhances the credibility of the show," he had earlier said in a press release. Sources say that there will be more celebrities taking part in the show.